The European Commissioner for Competition Margrethe Vestager has told technology companies that the “time is over” for them to escape rules in the digital world that apply in the offline world. The Danish politician has been a thorn in the side of big tech companies misusing their power. In July, she issued Google a record $5bn fine for breaching monopoly laws by forcing phone manufacturers to install Google apps on the device. Speaking at Web Summit, Europe’s largest technology conference, she outlined her vision for a digital future that ensures digital innovation works for everyone. “This future is arriving so fast that it becomes increasingly difficult to say what shape it will take,” she told the audience from the main stage. While Vestager is tough on misbehaving tech companies, she is keen to champion the benefits of technology to society: from making our lives easier in small ways, to changing the lives of those with inhibiting diseases or disabilities. But society needs to tackle the darker consequences of technology, she says, such as the spreading of harmful information that undermines democracy. One of the central arguments against regulation is that red tape impairs innovation. 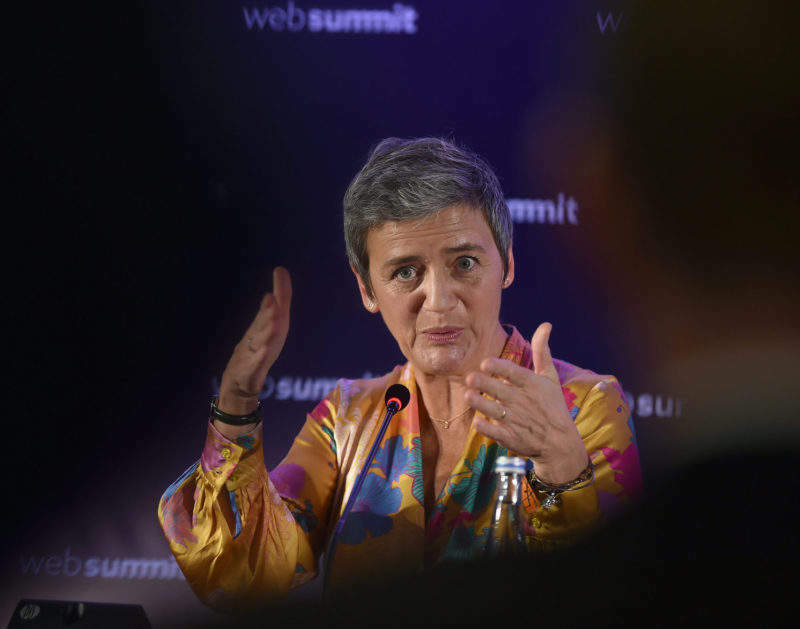 Vestager, however, disagrees and insists that competition laws, in fact, promote innovation. Nor should democracy be sacrificed for innovation, she added. Instead, it should protect those values. The way forward is to keep markets open and promotes open source software that benefits everyone, she says. Data has long been touted as the ‘new oil’, but society is still unsure how to handle its most abundant resource. And when companies form a data cartel, the impact on businesses and democracy could be disastrous. Vestager believes that this abuse of personal data has corroded trust in companies among consumers. But there is good news, she explained. With the “right rules,” it is possible to fix the problem. Drawing a comparison to the standards that protect consumers from being killed due to dodgy wiring in their home applications, Vestager shows that it’s not a culture that should be difficult to adopt. We expect authorities to tackle piracy, terrorism, or price fixing in the offline world – and that should be no different in a digital world, she explained. Recent political campaigns have shown how our own data can be used against us to influence our vote. This becomes clear with examples such as yesterday’s report into the misuse of personal data during the Brexit referendum. Margrethe Vestager also stressed the importance of tackling the threat of cyberattackers during elections. She also said that citizens have an obligation to teach children how to grow up in the digital world, while businesses have a duty to take responsibility.